April 15th is a big day in MLB history, and the league does a fine job of honoring it. It was the day Jackie Robinson first stepped on the field as a member of the Brooklyn Dodgers, and thus broke the color barrier in the sport that had been put up 60 years earlier. (He was not the first black player to play Major League ball. That was Moses Fleetwood Walker.) His first game was not as big a deal as you might think at the time. It was not a front page story on the New York Daily News, and the Times only had a short piece about it. The game was not a sellout. About 60% of the crowd was black. Robinson had a fairly forgettable game, going o-3 against the Boston Braves. The crowd roared it’s approval when Jackie performed well in the field. His first four games would pass rather quietly. It was a week later that things would turn ugly. Ben Chapman was born and raised in the deep South, and the Phils manager did not approve of the integration of Major League baseball. Therefore he encouraged his players to yell every racial epithet they had ever heard at the Dodgers first baseman, who unfortunately was playing the position on the field closest to the Phils dugout. The Phils players were relentless, riding Robinson so hard that several fans in the area wrote the commissioner to complain. The incident made waves, and after two games of viciously hounding Robinson, Chapman was told by Commissioner Happy Chandler to sit out the third game of the series. The Phillies PR team tried to protect their franchise, which was getting lambasted by the press. They had Chapman meet with the black media, explaining that “bench jockeying” was a rich baseball tradition, that his team called DiMaggio “The Wop” and White Korowski “The Polack”. Riding the opposition was the Phils way. A year later, Chapman was being hounded so mercilessly by the media and by fair-minded fans that Rickey had Robinson and Chapman pose for a photo together as a conciliatory gesture. Chapman refused to shake Robinson’s hand for the photo, so they instead each man held the same bat. The Phillies franchise was hurt by the incident, and Chapman was out of baseball a year later. 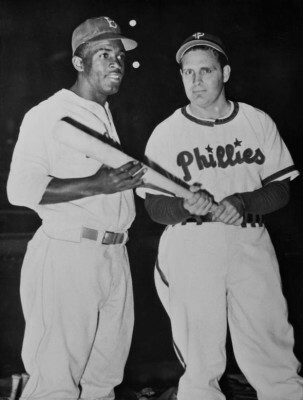 The Phils would not sign their first black player for 10 more years, the last team in the National League to do so. That player was a man by the unlikely name of John Kennedy, who got all of 2 at bats in the major leagues. As for Chapman, according to a 1994 Sporting News obituary, he possibly had some regrets a bit later in life. Not exactly a tear jerker, but it was a far cry from the Chapman of 1947. As for Robinson, I found this summation of him in Mickey Mantle’s book, The Quality of Courage, perhaps the most interesting thing I’ve ever read about him. There’s an odd thing about Jackie Robinson. I myself was never very friendly with him, and I have found that a lot of people who knew him in and out of baseball really dislike him. He’s a hard man for some people to like because he isn’t soft and smooth-talking and syrupy. He is tough and independent and he says what he thinks, and he rubs people the wrong way. But I have never heard of anyone who knew Jackie Robinson, whether they liked him or disliked him, who didn’t respect and admire him. That might be more important than being liked. If you liked this article, you may also like The Tragedy of Slim Jones.